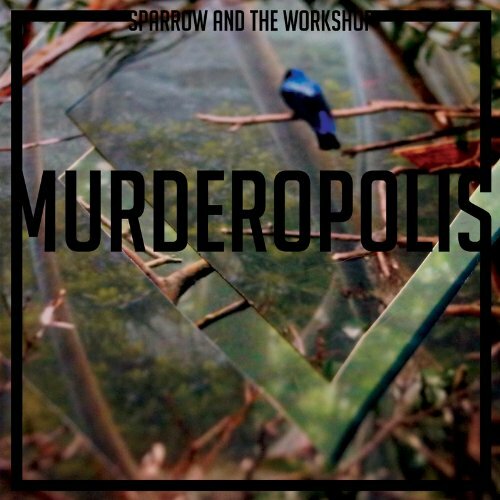 Murderopolis is Glasgow trio Sparrow and the Workshop's third album and it showcases the band ability to fluctuate between the light and shade of alt-folk-rock. It's all held together by the rumbustious vocals of Jill O'Sullivan. She delivers confidence and direct punch to the gut, as on 'Darkness', where she's buoyed along by a rampant, almost post-punk drum and guitar arrangement. On the promo copy I received, it states from another review that the band are "ethereal and electric". In all honesty, I think that is an insult to the range and beauty of O'Sullivan's voice. Her voice soars with an unnerving ease on 'Shock Shock'. It's reminiscent of the dream-folk duo Wye Oak but S&TW are much more bold and adventurous with their sound, while the mellifluous production has more than enough gusto to open doors to a new and unexpected audience. On 'Water Won't Fall', O'Sullivan sinisterly switches between the morose and inspiring: "You stand besides and you walk with me now/ but if you leave me where would you go?... Shoulder to shoulder, I walk with you now/ and with my virtue I'll try to stay strong". Murderopolis has an infectious musical template from which O'Sullivan releases her suppressed emotions and, while there are early songs such as the softly spoken 'Valley of Death', nothing can prepare you for venom of 'The Faster you Spin': "Everytime you smile you look just like an actor/ and every mood you make looks practised and it says you're nothing but a fame whore". It's a less than thinly veiled attack about seeing through someone for what they really are, delivered quite effortlessly with vitriol and sneering ease. 'The Glue That Binds Us' is the most beguiling song on the album: "I don't like you anyway/ I don't need you in my life". It's sung with steely and steadfast emotion but when O'Sullivan sings the next line, "Something about you keeps me in a state of mine", she sounds like she could be in one of Phil Spector's girl groups, such is the vocal range, power and flexibility in her locker. Closer 'Autumn to Winter' is a torch song of beauty, at times redolent of the cracked vocal of Hope Sandoval of Mazzy Star but, while it's sombre, it has plenty of power and wraps up Murderopolis perfectly. An album of unbridled power, raw emotion and haunting unease. I think we need to get someone outside his hotel so we know when he's on his way to Manchester. Going to be very annoyed if I don't get into that gig. Rumours are the gig in Manchester will be Friday and/or Saturday 21st/22nd Feb. Albert Hall is the supposed venue. I'm going to hound his PR agency all week. As soon as I know the full details I'll be sending an email to all SB members. If it's like the early London dates he might not announce it until Friday.